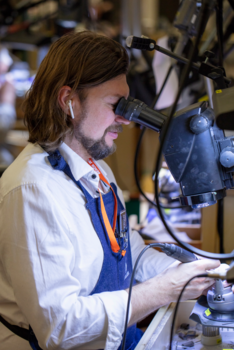 Stuller hosted its 19th annual Bench Jeweler Workshop March 22nd and March 23rd, with more than 160 jewelers from across the world visiting its global headquarters in Lafayette, Louisiana. The fourth annual Battle of the Benches competition also occurred during the two-day event. It consisted of two different challenges â€“ the Parts and Pieces Challenge, where contestants fabricated a custom piece on the spot from an assortment of components, metals, and gemstones. And the Ready, Set Challenge, where they prepped, polished, assembled, and set their original entry piece. The jewelers selected for this yearâ€™s competition were: 2018 defending champion, Patrick Dobbs of Hammerman Forge, Evgenii Fedko of Fedko Jewelry, Aleksey Saburov of Saburov Art Studio, and Joe Kremer of Joseph Kremer Inc. In 1970, Matthew Stuller founded Stuller, Inc. Headquartered in Lafayette, Louisiana; the prime manufacturer provides a wide range of goods and services for jewelry professionals worldwide. Stullerâ€™s core product categories include: bridal jewelry, wedding bands, fine jewelry, mountings, diamonds, gemstones, findings, metals, tools, packaging, and digital solutions. For more information, please visit www.stuller.com.